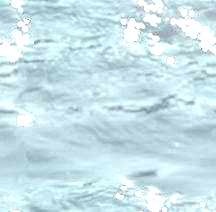 The 'Trieste' at the deepest point of all oceans! The research submersibles are the first, more peaceful part of the theme 'submarines'. The second part containing the military submarines will follow, see below. To the right we can see the prototype of the first submarine of the great designer John Philip Holland, the 'Holland No. 1'. In 1878 the tests were completed successfully and he continued to built military submarines. 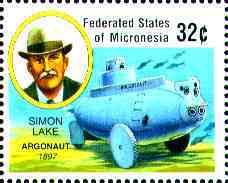 In 1897 the American shipbuilder Simon Lake built the 'Argonaut I'. The boat had a gasoline-driven engine to be able to drive above and below the water surface and real wheels to drive at the bottom of the sea. The crew got fresh air through long pipes leading up to the surface. The sub had an overall length of 36 feet and, in 1898, the boat conducted a succesful voyage from Norfolk to Sandy Hook. 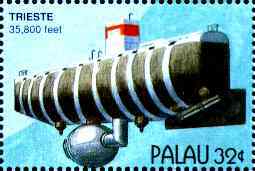 After World War II the development of so-called deep sea submersibles started. The crews in these boats were independent from the sea surface as they no longer needed a cable or chain to keep them aloft! 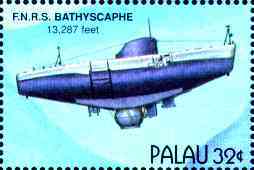 In 1948 Auguste Piccard developed the prototype of the 'Bathyscaphe' (Greek for 'deep vessel'). He named the boat 'F.N.R.S.2' - the abbreviation for 'Fonds National de la Recherche Scientific'. Actually this was the fund Piccard got his money from for research. (The F.N.R.S.1 was a balloon Piccard used for height research before). During the first unmanned test the boat reached a depth of 5,206 ft, later on 13,287ft. In 1953 the universe professor Auguste Piccard and his son Jacques built the bathyscaphe 'Trieste'. The boat had a length of 49ft and contained a steel ball with a strength of 3.5in and a diameter of 7ft. The window glass had a strength of 0.5 to 1.2ft, depending on the curve of the glass. For altering depth they used one large tank, filled with petroleum liquid, which is lighter than water and several smaller tanks filled with small steel bullets. In 1957 they reached a depth of 10,327ft. In 1958 the 'Trieste' was sold to the US-Navy. In 1959 the navy ordered a new steel ball from Krupp steelworks, Germany which was delivered in 1960. With Jacques Piccard and Don Walsh on board the 'Trieste' reached the deepest point on this globe, 35,800 feet below the surface, the Challenger Deep in the Marianen Ditch in the Pacific Ocean. In 1951 this place was discovered by the British research vessel 'Challenger II'. When this goal was reached, the true scientific research of the deep seas started. 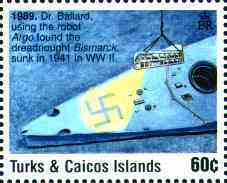 But the navy used the bathyscaphe as well. In 1963 the military submarine 'Thresher' was lost off the coast of New England. The 'Trieste' was sent in, searched und found the sub. After this incident a second 'Trieste II' was built. The French were very busy conducting deep sea research. 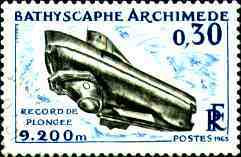 The 'Archimede' was another French bathyscaphe. She was on duty on many research voyages around the globe, for example the research of the Midatlantic Ridge. Most voyages were not as spectacular as the explorations of the'Trieste' but sound and succesful scientific work. The boat reached a depth of 31,164ft. Jacques Piccard developed a boat which was able to hover in middle depths. 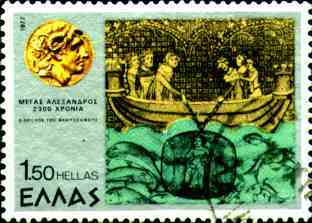 It became known as a 'Mesocaph' (Greek for 'middle ship'). The boat was named after the discoverer of the Gulf Stream, 'Ben Franklin'. The main task for this boat was to just drift along with the Gulf Stream to research the different levels of water. Most interesting this boat was even ordered by the space flight authority of the NASA as the NASA wished to test people living together in a tiny room for a long time. The Gulf Stream drift happened in 1969 for lasted four weeks. 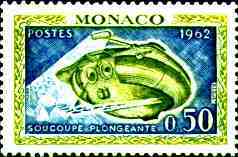 Jacques-Yves Cousteau started the development of small, maneuvrable submersibles. It was possible to lift these boats onto the deck of the transporting research vessel allowing for repairs during a long voyage. In 1957 he conducted the first test with his saucer 'Soucoupe'. With the unmanned boat hanging from a cable he reached a depth of 1968ft. While lifting the saucer the cable broke and the 'Soucoupe' sank back. As there was no chance to recover the boat Cousteau decided to build a new one. The new 'Soucoupe' was equipped with a grabber/manipulator, cameras, headlights and underwater jets. The oxygene tank could support two persons for up to 24 hours. 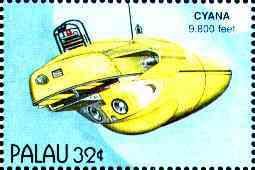 From 1959 Cousteau took the 'Soucoupe' along his research vessel 'Calypso'. Beside him his well-known submersibles 'Alvin'. This boat was built in 1964, sank in 1968, was recovered in 1969 and is still on duty up to today. In the last years she conducted approximately 150 diving trips per annum. The 'Alvin' has a length of 24ft, height 12ft, beam 8ft and she is able to dive down to 13,124ft. Cabin space allows for a crew of three, operating time 6-10 hours. Two manipulators/grabbers are able to lift up to 250 pounds, the speed is 2kn. The boat is filled with cameras, computers and measurement devices. In the end of the Seventies, beginning of the Eighties, a new three step strategy for diving expeditions was commonly adopted. 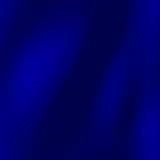 Firstly a chart of the deep sea bottom was made by sonar devices of the research vessels. Secondly towed camera-systems scanned the bottom of the sea for interesting areas or objects. 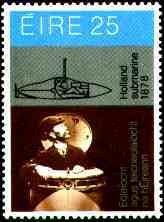 'Angus', 'Argo' or 'Deep Tow' were such tow systems, as depicted on this stamp. The tow systems were fitted with cameras and sonar devices on both sides, so they could observe a broad search arc of 200 to 300 meters. 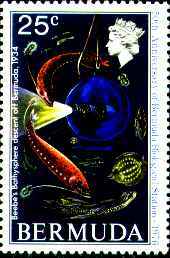 Thirdly they sent in the manned submersibles like 'Alvin', 'Cyana' or 'Nautile' down to the interesting objects for an exact analysis. Further developments included AUV's (abbreviation for Autonomous Underwater Vehicle) and the ROV's (Remotely Operated Vehicle) - both of them unmanned, remote controlled robot crafts. On the souvenir sheet below we can see the 'Alvin' hovering above the 'Titanic'. 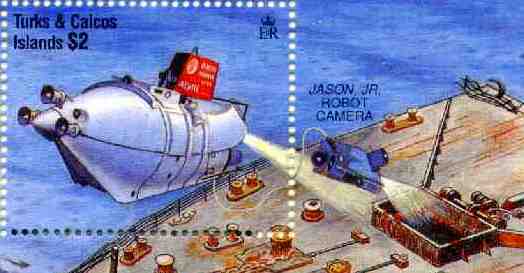 In front of 'Alvin', controlled by a cable, there is the robot 'Jason jr.', who is send into the inner areas of the wreck. 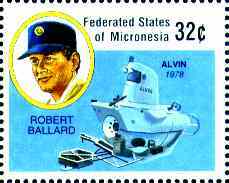 This happened in 1986 and Robert Ballard was aboard the 'Alvin'. 'Jason jr.' was able to reach even the captain's cabin. The 'Titanic' is located 12,267ft beneath the surface. 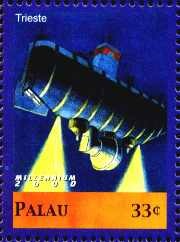 The US-Navy used these submersibles as well. In 1966 'Alvin' found a lost American hydrogen bomb in the Mediterranean off the Spanish coast! And in 1968 a Soviet submarine sank in the Pacific with secret code books and nuclear warheads. The US 'Halibut' secretly examined the lost Soviet sub. 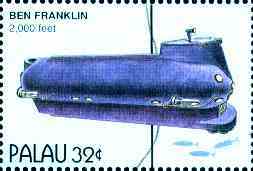 In 1963 the US sub 'Thresher' and in 1968 the US sub 'Scorpion' sank. 'Trieste', 'Trieste II', 'Argo' and 'Jason jr.' searched for the subs, found both and examined the two wrecks. In World War II the German battleship 'Bismarck' was sank by the British Navy in the vicinity of the Biscaya. 2,106 mariners aboard the 'Bismarck' died. In 1984 Rober Ballard found the 'Bismarck' with his tow-system 'Argo' 15,700ft below the surface. The battleship sits plain on his keel, similar to the 'Titanic'. The gun towers had fallen out (see stamp). Ballards photos confirm theories, that the 'Bismarck' sank because sea-valves were opened by German sailors not because of the damage caused by its enemies. The Russians also took part in deep sea research. 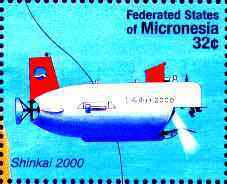 In 1987 they built the submersibles 'Mir-1' and 'Mir-2'. Both subs are able to dive 19,800ft below the surface and stay under water for 17 to 20 hours. The Soviets conducted a few research voyages with these boats, but they received worldwide attention, when the Russians offered diving trips to the 'Titanic' for a price of 35,500 US- Dollars for each person. The subs have room for one pilot and two visitors each. The trip to the 'Titanic' takes eight hours. The American film producer James Cameron rented a Soviet boat when he made his 'Titanic' film in 1995. During these 'tourist trips' minor damage to the 'Titanic' was caused by the submersibles. Soviets and French accused each other. In 1993 the French used their submersible 'Nautile' to recover shiploads of objects from the 'Titanic'. In the early Seventies the French build the submersibles 'Cyana', a further advancement of Cousteaus saucer 'Soucoupe'. Up to today this boat has conducted more than 1,300 diving trips. During a lot of expeditions she worked along 'Alvin' and 'Archimede'. Her measurements are: length 18.5ft, beam 10ft, heigth 8ft, operating depth 9,800ft, crew three persons, speed 2kn, operating time 6-10 hours. 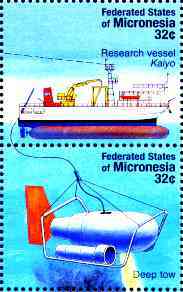 The Japanese were constructing manned submersibles as well. After the 'Shinkai 2000' the 'Shinkai 6500' followed. Both numbers mark the operating depth in meters of the respective boats. Each sub there serves up to three persons at one time. The standard Japanese crew consists of two pilots and one scientist. 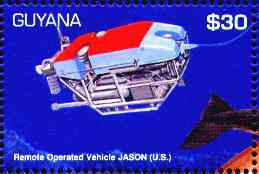 'Jason' is an unmanned, remote controlled vehicle (ROV), which has to be connected to a tow-system like 'Argo' or 'Medea'. He is a deep sea robot with his own engine, headlights, cameras and grabbers. The robots were used in difficult, dangerous areas. R. Ballard shot 84 TV shows for school children in North America using 'Jason'. So approximately 200,000 children researched a Roman wreck and an under water volcano in the Mediterranean. 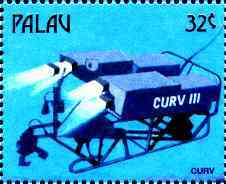 'Curv III' is a remote controlled vehicle as well. He was constructed especially for deep water recovery. The robot can work up to 20,000ft below the surface. Inside of the 'Curv' there is a small recovery craft and the latest equipment for deep sea technology. Just click on this line if you would like to see our 'Submarines Part II' page regarding naval submarines from their earliest beginnings until the outbreak of World War Two.